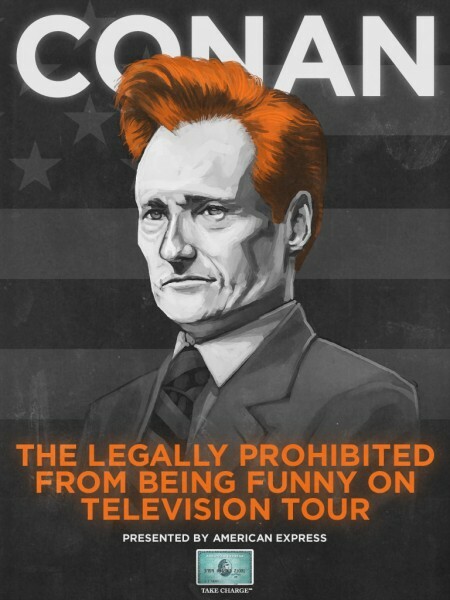 After finishing up his recent tour (see poster above), Conan’s new show is finally upon us. Say what you will about the non-musical bits of his prior show, but historically Conan has exhibited very good taste in music. He’s provided great performances by everyone from Bowie to Wilco to Neil Young to The National to the Strokes, and on and on. And he’s provided three great viewings of one of our and your (gotta be, right?) faves, Radiohead. Below is Radiohead’s 1993 performance of Creep, which is alternately glam (ya gotta love Yorke’s peroxide-blonde ‘doo) and overly theatrical. But despite these humorous distractions, even back then you could see the impending talent in spades. Check out Thom Yorke’s vocal squall at minute 3:00 and enjoy Johnny Greenwoods’ passionate guitar thrashing. If you can find them, the two other Radiohead performances were of Fake Plastic Trees in 1995 and House of Cards in 2008. In addition to this hysterical historical performance by Radiohead, check out the comedic, but musically talented, Jonathan Richman perform one of our favorite Richman songs, I Was Dancing in the Lesbian Bar. And finally, check out Neil Young’s send-off of Conan from the Tonight Show via his great song, Long May You Run. Neil Young – Long May You Run from the last Tonight Show with Conan O’Brien from John Matthews on Vimeo. We assume there will be more phenomenal performances on his new show on TBS. Bonne chance, Conan!